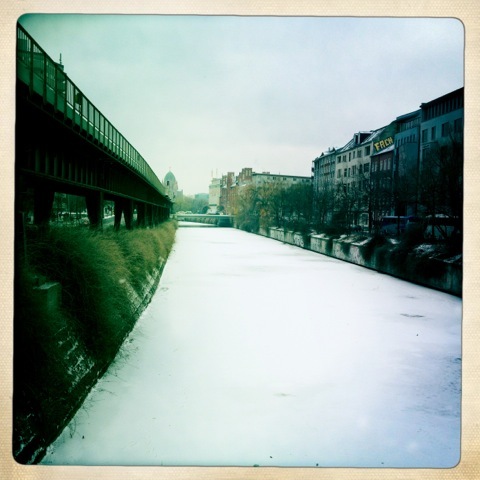 I'm writing this for those of you who might want, someday, to take part in the Berlinale Talent Campus. As one young film maker said, "There is life before the Talent Campus and there is life after the Talent Campus." And, looking back on it, he did have a point. It is a game-changer. The first day begins at 8.45 when a small fleet of red buses take 350 of us down to Talent Campus HQ, next to a long block of canal-shaped ice. We wander into a modern, but smallish theatre building and find ourselves immediately 'queued'. This is one of the many queues that punctuate our days. This one, the first of the morning, is for our complimentary tickets for films and events. It stretches up two flights of stairs and could test the patience of anyone who hasn't eaten yet, but the atmosphere is actually quite fun with time to chat to fellow "Talents" whilst blindly circling films from 6pm onwards. However, by the time my part of the queue gets to the desks they have virtually no tickets left – which changes as the week goes as we learn to get up earlier to get the earlier public buses that will beat the queues for the tickets we want. Then back to the ground floor for the second queue, this one is for breakfast. Again, by the time my part of the queue reaches its goal the breakfast has gone apart from one croissant – which nobody touches in case somebody knows something we don't… You learn the lessons of herd mentality quickly here. We get a launch chat from two super-cheery presenter-types then dive into "Global Speed Matching". Strangely exhilarating this. Much more fun than you would have imagined. We smile zealously at each other - and mean it. Because we are genuinely interested in what other 'Talents' do and if we could work together on real projects. Perhaps its the air of creative possibility, perhaps its the sheer energy smiling gives you. But the rationale is simple: wherever you come from will have its own particular limits on what you want to do – so this is the simple solution: team up with someone from a country with different limits and with different skills. 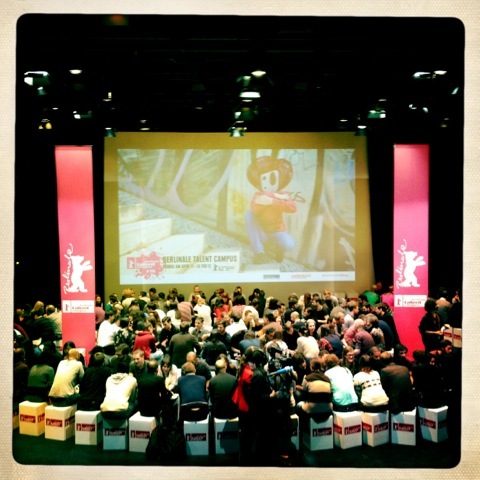 That evening we head to the main cinema for the official opening ceremony of the 10th Berlinale and cake. As part of the ceremony we watch the five short films that were made for the "Berlin Today" award by last year's alumni and hear a very touching speech by the director, Dieter, about how working together contributes to world peace. The films are of a uniformly high standard – nothing particularly stands out but they are all very good – and the atmosphere is very jolly. However, what I'm really looking forward to is hearing Kossakovsky speak tomorrow.